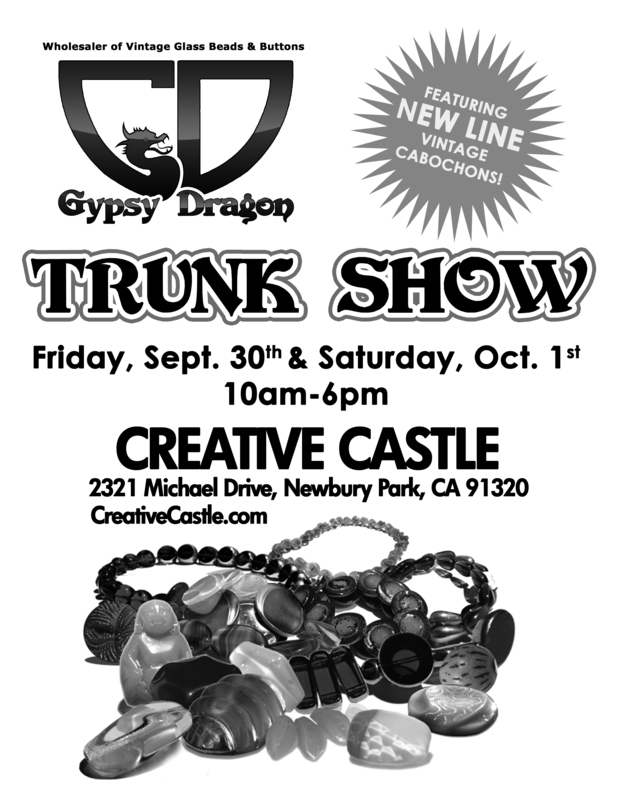 Join us at Creative Castle this Friday and Saturday and see a showcase of our new line of gorgeous cabochons!!! A large selection of our many varieties of vintage glass beads and buttons will also be on display! TRUNK SHOW FEATURING NEW LINE OF VINTAGE CABOCHONS! 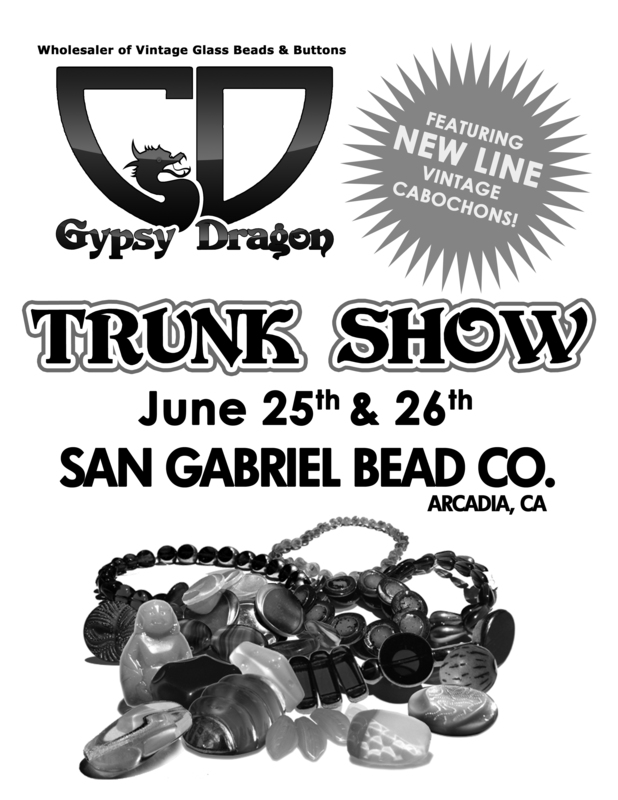 We will be in Arcadia this Saturday & Sunday, June 25th & 26th, showcasing our large selection of beautiful vintage glass beads & buttons! ALSO FEATURING OUR FULL LINE OF RECENTLY ACQUIRED VINTAGE CABOCHONS! WE WILL BE BRINGING A VERY LARGE SELECTION OF OUR BEAUTIFUL VINTAGE GERMAN GLASS BEADS & BUTTONS WITH SHARP BRIGHT COLORS TO TUCSON FOR THE TO BEAD TRUE BLUE SHOW AND TUCSON BEAD SHOW! 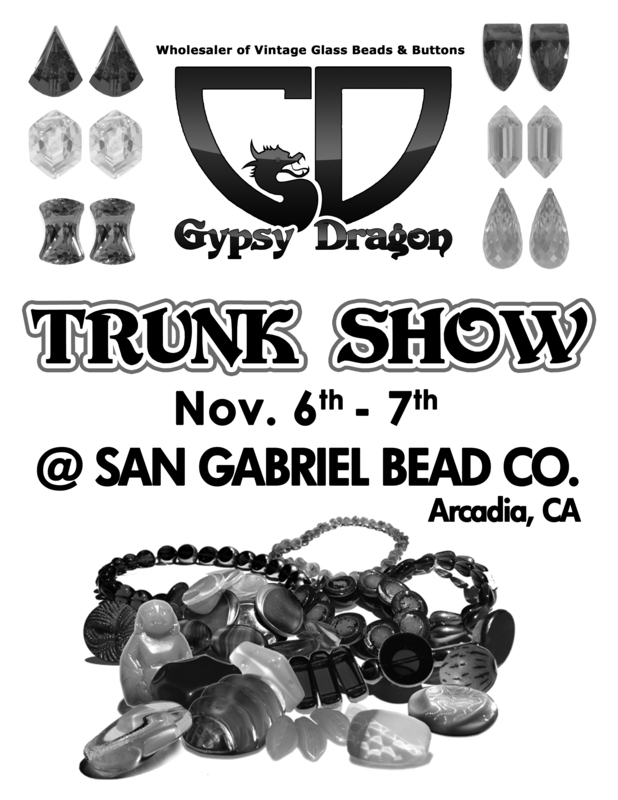 NOVEMBER TRUNK SHOW - San Gabriel Bead Co.
We will be in Arcadia this Saturday & Sunday, November 6th & 7th, to meet the good people at the San Gabriel Bead Company for a great trunk show! So come meet us and view a large selection of our beautiful vintage glass beads & buttons! Meet us in Brea, California this Saturday & Sunday (October 30th & 31st) for another spectacular trunk show! We will have a great amount of vintage German glass beads & buttons on hand as well as other beautiful beads from around the world! 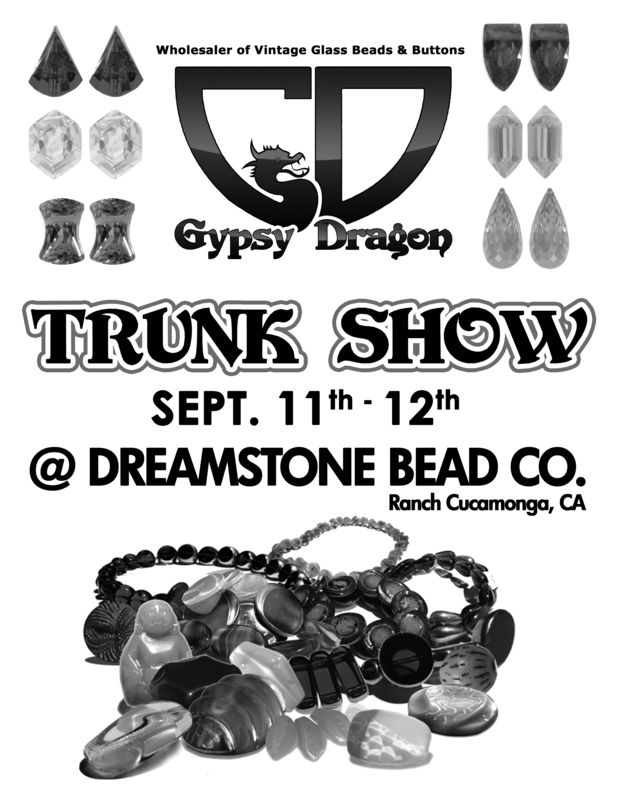 Come out to our September Trunk Show at DreamStone Bead Co. in Rancho Cucamonga! As always, we will be showcasing a large selection of vintage glass beads and buttons from around the world! JOIN US AT THE BIGGEST CONSUMER BEAD SHOW IN THE WORLD! Frontier Airlines Center in Milwaukee, WI from June 6th to the 13th! As always, we will be exhibiting a HUGE selection of our beautiful, rare inventory. Please join us and the Virginia Beadazzled Staff to choose from a great selection of Vintage German Glass Beads & Buttons made 1945 - 1969. Come see us at the 2010 Innovative Bead Expo in Cromwell, Connecticut! The Beads Expo - Cromwell is one of the biggest events for the gems and bead industry along the East Coast. The event will provide a best platform to meet all the professionals from related industry at one place. For 2 days the expo will be taking place at the Crown Plaza Cromwell. Gypsy Dragon will be showcasing a large selection of our beautiful vintage glass buttons & beads! Join us for a Trunk Show at Orange County's largest bead & button store, Brea Beadworks on Saturday & Sunday, April 17th & 18th! We will be showcasing a large selection of beautiful vintage glass, silver, and stone beads & buttons!